The Connector Chain block is probably known by a different name as well, but that is the only name I found, so I'm going with it. 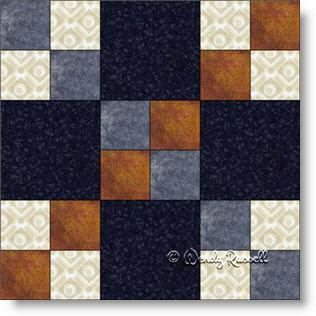 This quilt block is a combination of a four patch (the "checkerboard" units in the centre and the corners) and constructed as a simple nine patch block. It is an easy block to make since the only shape used is the square. Blocks like this one are often used as connector blocks because of the diagonal chains that result from the placement of the four patch units. In the sample quilts illustrated, I have used 90 degree rotations to come up with different layouts using only this one block.